Luke and Isabel had an assignment from their "History of the World" class, to call one of their grandparents and interview them. What a great idea. I love how such a simple thing teaches them how we get history. (And of course teaches them about their grandparents.) When Luke was about to call his grandpa, he said, "I sure wish I had a Hedephone for this." Last night we went to a luau at our church. As soon as I told Isabel about it the night before, she was so excited and got out what she was going to wear. 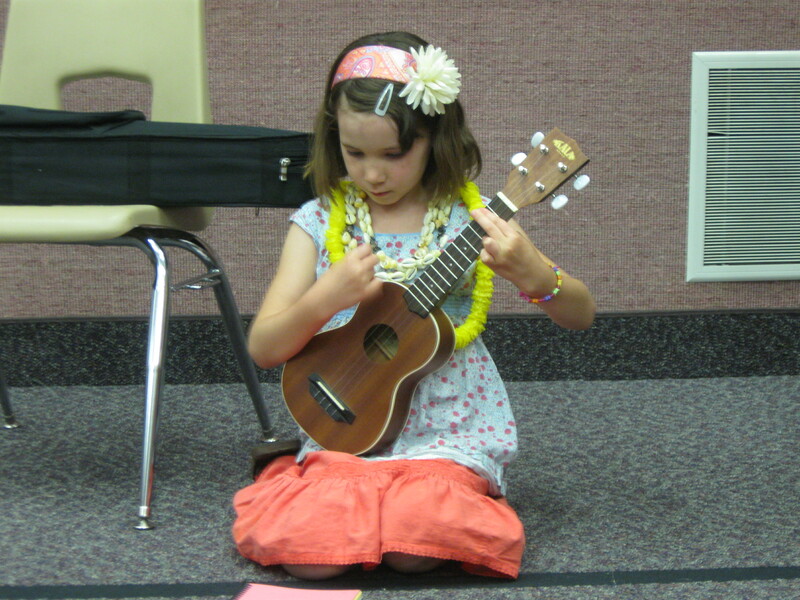 She also told me that at the luau, she wanted to play the Hukilou song on her ukulele. I feel so bad that I didn't think of this and plan a head. But I am sure glad that Isabel thought of it and that our friend Shellie, who helped run the whole luau, was flexible enough to let Isabel play. She did such a great job and everyone clapped like crazy when she finished! Hooray Isabel!